A organization of yakuza is divided into vertical hierarchy from top to bottom. The members model the structure as a family, which consists of a father, his brothers, his children, and mediators. Taking Yamaguchi-gumi –the largest yakuza syndicate– for example, it has some kinds of leader class under the one boss (Kumicho：組長): six quasi-yonger brothers (Shatei:舎弟), and about 80 quasi-junior leaders (Wakashu or Wakachu:若衆 of 若中) , and a headquarters chief (So-honbucho: 総本部長). Take a closer look at them. Among the children, Wakashu, there is a No.2 of the entire syndicate (Wakagashira: 若頭), and seven its assistants (Wakagashira-hosa: 若頭補佐). And below it, 10 members of Wakashu who are almost Wakashu-hosa (Kanbu: 幹部). So-honbucho acts like a executive director. Wakagashira, wakagashira-hora, and So-honbucho form the executive section. 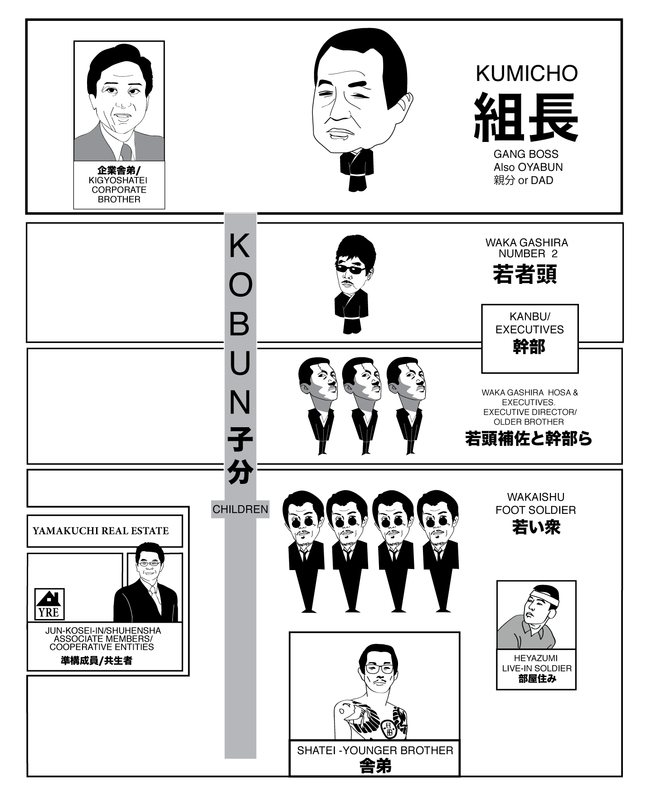 The below chart has some different part from description above, but it nicely visualizes the hierarchy of Yakuza with caricature. In Yamaguchi-gumi, the bosses of the secondary group are summoned at the headquarter in Kobe every month. They are obligated to make certain payments. For instance, Non-executive Wakashu must pay around 800,000 yen($7810), and Wakagashira-hosa must pay around 100,000 yen($9762) a month. The system is like a franchising of legitimate company. While The members at the bottom of hierarchy make money with the infamous name of the yakuza, they must pay charge for using the name. Another incentive of paying money for superior is carrier ladder to the top. If he contribute the group, he might have a chance to be moved up by the boss. On the boss-side, They need not work for the money. Rather, since lowers take the risk of arrest, the boss is safe. It had a little bit changed when bosses were accused of “employer liability” though. A note on “Yakuza money”: How recent yakuza earn from venture market. Recent police and residents conflict with yakuza armed with military weapons. Yakuza’s concealed military weapons seized in many place of Japan. An Iranian boss of the yakuza arrested.